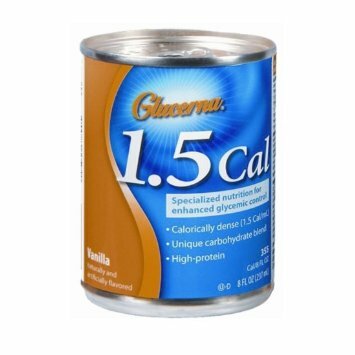 Glucerna 1.5 Cal is specialized high-calorie nutrition with a unique carbohydrate blend for enhanced glycemic control. Glucerna 1.5 is a calorically dense formula that has CarbSteady, a unique blend of carbohydrates, including slowly digestible carbohydrates clinically shown o help minimize blood glucose reponse. Glucerna 1.5 Drink is ideal for those with type 1 and type 2 diabetes. Also ideal for patients with hyperglycemia/abnormal glucose tolerance resulting from metabolic stress, such as illness, trauma, and infection. For tube or oral feeding. Vanilla flavor.